Still learning the digital drawing, but I’m getting better. I need more time to play but I’ve had a hard enough time being consistent with the Worldbuilding Project. I’ll probably miss tomorrow as well but like Jake said I’m partly done. I considered taking a week off and focusing on the distractions, but they seem to keep coming so as a bonus I hopefully can learn how to work around them and get all my creative tasks done. I’m going to try to sneak in another Finally Watched this week but we’ll see what happens. Over at The Clutter Reports…I didn’t post what I reviewed there last week, did I? It was the first of the three Transformers Alternators I have, Smokescreen. This week I went over the trade for Superman/Doomsday: Hunter/Prey. Next week it’s back to the Alternators. Not much else to report this week. Hope you like what’s coming up. 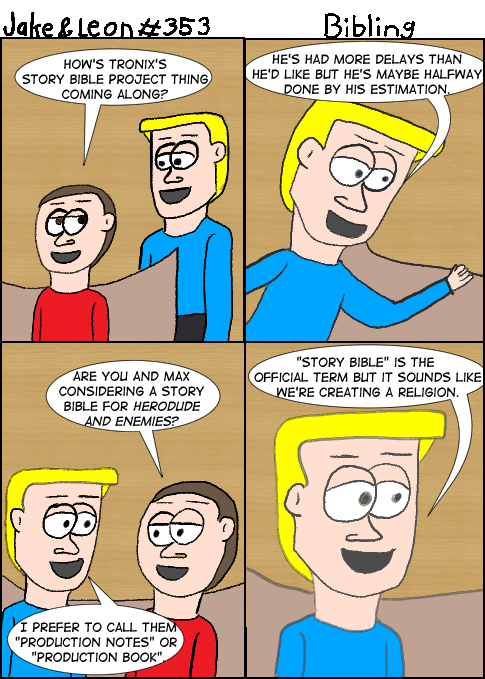 Posted by ShadowWing Tronix on February 18, 2018 in BW's Worldbuilding Project, Jake & Leon and tagged comic strip, Jake & Leon, webcomic, worldbuilding.